We are using Visual Studio SQL Server Data Tools (SSDT) projects more and more. Initially we were using it for getting the database under source control but now we are also using it for deploying the database even with data included. One way to include data is to add a script file in the SSDT project with ‘insert into’ statements but because our requirement was to include a lot of (meta)data everytime the project was build we came up with another solution. I will describe the solution based on the AdventureWorks sample database which can be downloaded from here. I used Visual Studio 2015, SQL Server Data Tools and SQL Server 2014. I created a new solution with two projects. The first project is a SSDT project. For simpilicity I have only included the table Person.CountryRegion in the project and some related objects like User Defined Types and a Schema. In the Post-build event of the project the SQL Server utility bcp is called to export the data to a file in the build output directory. When building the project the data is exported to the file Person.CountryRegion.dat. A Post-Deployment Script is added to the SSDT project. For inserting the exported data we are using a BULK INSERT statement. In this statement a SQLCMD variable is used with the name $(DataFiles). This variable must be set to the build output directory when deploying the database so it can find the Person.CountryRegion.dat file. The SQLCMD variable is specified in the SQLCMD Variables tab of the project properties. Now everything is setup to create a dacpac file for deploying the database and also deploying the data. I created a console application for testing the deployment of the dacpac file. The NuGet Package Microsoft.SqlServer.Dac is installed for the necessary assemblies to deploy a dacpac. There are also other ways to deploy a dacpac like SqlPackage.exe, PowerShell, etc. With the DacDeployOptions class we can set the SQLCMD variable DataFile to the build output directory. When we run the console application a database with the name AdventureWorksTest is created with the table Person.CountryRegion filled with data. The Visual Studio 2015 solution can be downloaded from GitHub. Don’t forget to set the console application as Startup Project in Visual Studio. For running this example also SQL Server Data Tools and the AdventureWorks sample database is needed. At Reasult we develop financial forecasting software for the Real Estate sector. We have to deal with a lof of numeric input values in our WPF applications. Al lot of our customers are used to work with Microsoft Excel. When in Excel the decimal key on the numeric keyboard is pressed always the decimal separator specfied in the regional settings is used. This is not the way a normal Windows (WPF) application handles this key. With the following piece of code you get the same behavior as Excel. Whenever the decimal key on the numeric keyboard is pressed the event is cancelled and the decimal separator specified in the regional settings is used. At Reasult we are currently working on a new UI style for our WPF applications. One of the UI elements we will use is an Apple style navigation bar. With WPF is relative easy to create such kind of a control. The trick is to find a standard control which has the behaviour we need. In this case we need ´select item´ behaviour and the ListBox is a good candidate. The only thing we have to do is to change the default ListBox appearance. Because I´am not a graphical designer I search the internet for some information about the styles Apple is using for the navigation bar. In the article The Apple.com navigation menu created using only CSS3 you can find a lot of style information. I tried to use all the style elements but some effects are not easy to create with WPF so I skip a few effects. We start with creating the NavigationBar class which inherits from the ListBox. The first thing we must change in the appearance is the direction of the ListBox items. Default the items are showed in vertical direction but for the navigation bar we need items displayed in horizontal direction. The next step is to define the style for the navigation bar items. First we create a NavigationBarItem class which derives from the standard ListBoxItem. The NavigationBarItem has a border and each border side has a different color. With the standard BorderBrush is not possible to assign different colors to every border side. To achieve this a custom BorderBrush is used. 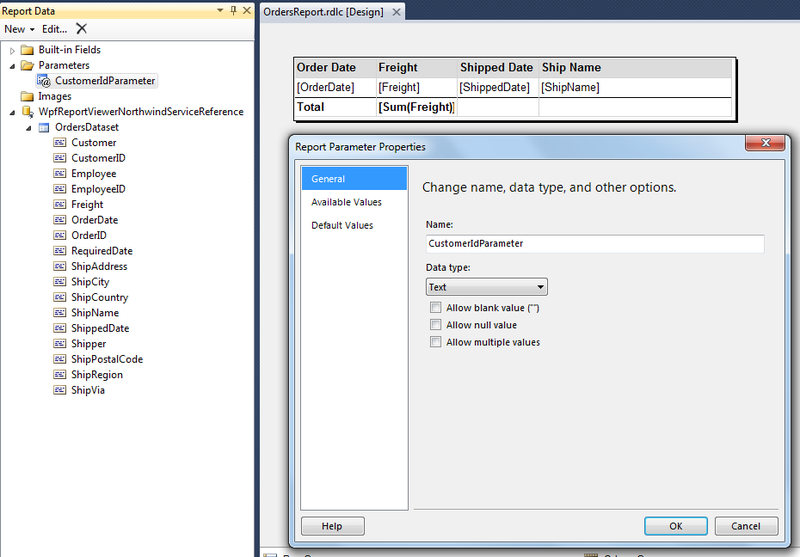 In the previous post I wrote how to use the Microsoft ReportViewer with a report and a subreport in a WPF application. In this post I’am going to describe how you can localize a RDLC report because out of the box there is no support for localization. With localization I mean that all the labels, table headers, etc are being translated depending on a language setting in the application. I use the Visual Studio solution of my previous post about the ReportViewer as a starting point. The report TextBox control has a property called ValueLocID. This property we use to store the name of a translated term which is stored in a resource file. In the XML of the RDLC report the TextBox control property ValueLocID is stored in the LocID attribute of a Value element. The value of this attribute we are going to use to translate and replace the innerText of the Value element. Before the report is loaded into the ReportViewer we are going to translate the report with a helper class. In line 16 we load the report definition as a Stream object. This Stream object is the input for the TranslateReport method of the RdlcReportHelper class. The same steps are done for the subreport. In line 11 we set the current UI culture to Dutch (Netherlands) so all the TextBox controls which have a value set for the ValueLocID property are translated into Dutch. 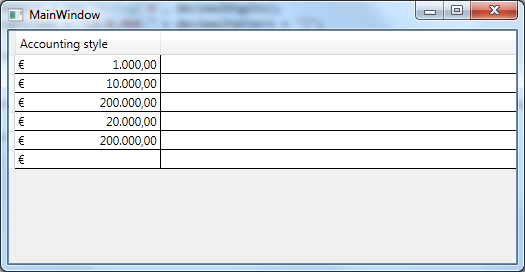 In the TranslateReport method of the RdlcReportHelper class we create a XDocument object from the Stream object. Then we iterate through all the Value elements. If a Value element has a LocID attribute we trying to find the translated term in a resource file using the value of the attribute. 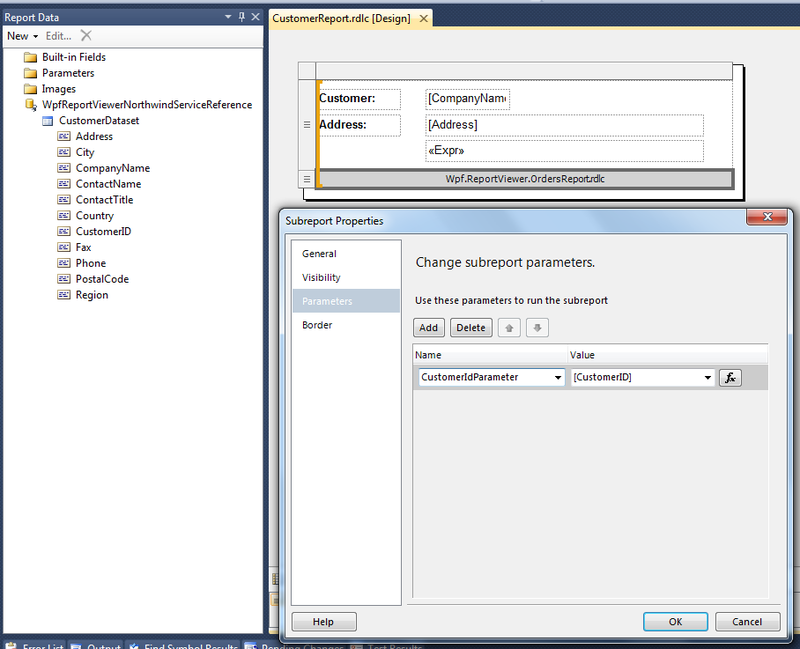 The Microsoft ReportViewer control is a powerfull control for embedding reports in a .Net application. There are two versions of this control: a WinForms version and a WebForms (Asp.Net) version. Unfortunately there is no native WPF version available at this moment but it is possible to use this control in a WPF application as explained later in this post. As mentioned before the ReportViewer control is not available as a native WPF control but only as a WinForms and WebForms control. With the WPF WindowsFormsHost control is possible to host WinForms controls in a WPF application so also the WinForms ReportViewer control. After adding the references you can use the ReportViewer control in XAML. The RDLC reports can use many different sources as datasource. In this post I’am using the public available Northwind OData service as datasource. To use this service add a service reference in a Visual Studio project (in my case a WPF application) to http://services.odata.org/Northwind/Northwind.svc.To retrieve data from this datasource I created a Repository class which is responsible for communicating with the service. This Repository class will be used later in this post. We will use two reports: a (main) report which shows customers (CustomerReport.rdlc) and a subreport (OrdersReport.rdlc) which shows the related orders. The CustomerReport uses the Customer dataset from the service reference as datasource and the OrdersReport will use the Customer (Orders) dataset as datasource. 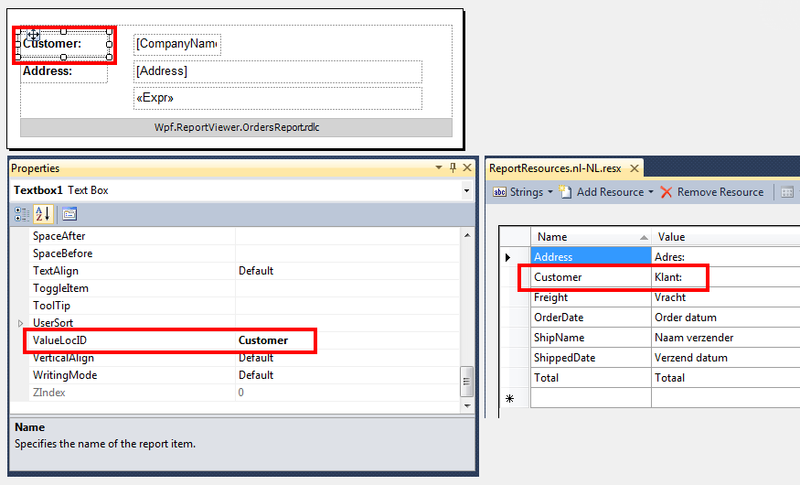 In the subreport a parameter (CustomerIdParameter) is defined which is used for passing the customer Id from the CustomerReport to the OrdersReport (subreport) so the related orders can be retrieved and shown. This parameter has to be filled in the CustomerReport. Therefore we have to specify in the properties of the subreport in the CustomerReport which field from the customer dataset is used for filling this parameter. The reports are now ready to show the data. The last thing we have to do is telling the ReportViewer control to show this report. We already placed the ReportViewer control in a XAML file. In the code behind of the XAML file we have to add some code. Because we are using a subreport we have to subscribe to the SubreportProcessing event of the ReportViewer. Each time a customer is rendered in the CustomerReport this event is fired. In the event arguments the value of the CustomerIdParameter is passed which we will use to retrieve the related orders from the OData service. After retrieving the orders data we fill the dataset for the subreport. In the company I work (Reasult) we use Windows Identity Foundation (WIF) for claim based security in our software. By specifying the RoleClaimType you can indicate which claims are representing the user’s roles. With the general Thread.CurrentPrincipal.IsInRole method you can check if the current user has one of those roles. The roles are used in the WPF application to check if an user is allowed to execute a certain action. Most of the time those actions are WPF Commands. We were looking for a nice and clean way to specify which role an user must have to execute a certain Command. Therefore we created a custom attribute which can be set on the Execute method of a Command. In this AuthorizationAttribute you can specify which role the user must have so he is allowed to execute the action. The AuthorizationAttribute has two properties. A Role property for specifying the role and an AuthorizationType property (enum) which indicates if you must have the role (Allow) or the user must not have that role (Deny). The RoleBasedSecurityCommand class is based on the relay command of Josh Smit but in the constructor the IsAuthorized method is executed. This method will read the AuthorizationAttribute attributes specified on the CanExecute method and check if the user has a certain role (Allow) or must not have a certain role (Deny). When the CanExecute method is called by the WPF framework and the user is not authorized it will return false. If a button is bind to this command it’s automatically disabled because we make use of the ICommand interface. The RoleBasedSecurityCommand is just a basic implementation to work with role based security. It can be extended to support more complex role checks.